OK, so it’s not that much of a secret, but there still are some things about Total Depravity that Calvinists will often not say when they are first presenting their views to others. To really get at the ideas below, you have to know what questions to ask. Total depravity sounds biblical until you start to dig around in it and see all the secret logic that goes with it. So next time you hear a Calvinist talk about Total Depravity, ask some of the hard questions, and see what they say! First, as sinful, unregenerate human beings, people can do nothing good for God, nothing to earn or merit eternal life, and nothing which might put them in God’s good graces. Frankly, I agree with this, as do most Christians. It is because Calvinists use this widely-accepted Christian idea that their system of beliefs gains acceptance as well. Usually, once a Calvinist is able to gain assent to this first idea of their doctrine, they quickly move on to the second main point of Calvinism, that of Unconditional Election. We will look at this point in later posts, but for now, we need to slow down and consider several steps within the Calvinistic logic which occasionally go unmentioned. Based on the idea that a person cannot do anything good to please or appease God or to earn eternal life, the Calvinist, if pressed, will say that this includes faith. They would argue that “believing in Jesus” is a good thing, and since we cannot do anything good, we cannot even believe in Jesus. In this way, they are saying that faith is a good work, or that faith is meritorious. In an earlier post we looked at several Calvinistic quotes which stated this very thing. But of course, this is exactly where the discussion of Total Depravity begins to get off course. Faith is not a work, and is not meritorious. We will see why later in this series on Calvinism, but for now, let us continue to follow the Calvinistic logic. Following on the idea that faith is meritorious, and therefore impossible for an unregenerate person to do, Calvinists nevertheless recognize that there are scores of passages all over the New Testament which call unbelievers to believe in Jesus for eternal life. So they say that since God requires people to believe in Jesus for eternal life, but knows that they cannot, God Himself gives the “gift of faith” to people so that they can then believe in Jesus. They have a couple texts they use to defend this idea, one of which is Ephesians 2:8-9, which will be considered tomorrow. Some people object, of course, to the idea of God giving the gift of faith to unregenerate people, for if unregenerate people can do nothing good—not even believe—then the gift of faith to unregenerate people is worthless, for the unregenerate person would be able to do nothing with it. In other words, if unregenerate people can do nothing good, then they cannot believe even if God gives them the gift of faith. So to solve this problem, the Calvinist says that “regeneration precedes faith.” In other words, God regenerates a person before they believe, in order that they can use the gift of faith which He gives to them. Again, there are numerous quotes in the post called “Regeneration Precedes Faith” which allows Calvinists to explain this idea in their own words. No matter how it is explained, however, this idea is more blatantly wrong than any of the other logical steps leading up to it. Scripture everywhere states that people are given life (or regenerated) in response to their faith; not as a precondition to it. In Colossians 2:12, for example, Paul states that we were raised with Christ (that is regenerated, or “made alive,” 2:13), through faith (cf. John 3:16-17; Acts 5:32; 15:7-9; 16:30; 1 Pet 1:22). 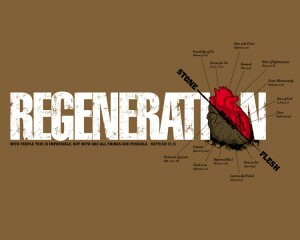 People are regenerated by God because they believe; not so that they can believe. One of the key texts to support his idea is Ephesians 2:5, which we will look at tomorrow. Was Any of this a Secret to You? If you have done much reading on Calvinism, none of this was probably new to you. But if you haven’t read much about Calvinism, was any of this new? Had you heard any of this before? What are your initial thoughts? Let me know in the comment section! Paul… I cannot post everything in one post, but I do try to link to other posts where other details can be found. I linked to the post where I included numerous Calvinists who say that faith is a work. Some of the Calvinists quoted there are RC Sproul, JI Packer, and Gerstner. All leading Calvinists. Are they misrepresenting Calvinism? Seems like bashing Calvinism has become Jeremy’s god. Idolatry is a sin. Disagree if you want, but be kind. Future comments that amount to name calling will be edited or deleted. If you choose to disagree, be specific. Calling into question, a set of beliefs, is not idolatry, nor bashing. Is it idolatry to question beliefs? Or is the real idolatry to hold on to beliefs without examining them critically in light of Scripture? I cannot include everything in every post. If you had read the post, you might have noticed that I linked in it to a post which contains numerous quotes from leading Calvinists who teach that faith is a good work. So I guess Calvinists are misrepresenting themselves? Great post Jeremy. I agree. Faith is simply trusting and believing. The idea that we would have to be regenerated first is where the logic begins to fail. As someone who used to see the value of Calvinism, (but never a diehard) I really appreciate you sharing your wisdom and insight on this important belief system that has seen a massive resurgence in the last few years.